T-shirts are one of the greatest inventions of modern times. Just about everyone has at least a few of these leisurely staples in their closet, and some won’t wear anything but. With their comfortable fit, soft textures and catchy graphics, they’re the antithesis of formal wear. That’s why at first glance, a tuxedo t-shirt seems a bit ironic. While a traditional tuxedo includes a complicated ensemble consisting of a jacket, trousers, a waistcoat or cummerbund, a dress shirt, a bow tie, dress socks and polished dress shoes, the tuxedo t-shirt condenses all of those trappings into one easy-to-wear piece. This popular trend is a humorous take on the formalities of life as they relate to the wardrobe. The classic tuxedo t-shirt features a white image of an imitation tuxedo shirt, jacket lapels, bow tie and sometimes a flower, printed on a black t-shirt. Just like regular tuxedos, the shirts can also be found in different colors, such as light blue or white. Varying color schemes are also available to imitate tuxedo ensembles, such as a black shirt with a red vest and tie. But who really cares which one you pick? The attraction is the tongue-in-cheek humor and the fact that you can pull off wearing a t-shirt when you should be wearing a tuxedo! Tuxedo t-shirts aren’t for every occasion, but here are a few situations where the look may just be appropriate. 1. At the beach. Your date will be so impressed that you dressed up for your big night out. Well, sort of. The tuxedo t-shirt will make you look dressed up without have to get dressed up, which is why it’s genius. Plus you’ll stay cool if it’s hot out. 2. At parties. The tuxedo t-shirt is the perfect get-up for a party. Not only will you stand out in the crowd, you’re sure to get lots of comments from men and women alike. Best of all, the ladies will know that your personality is even more attractive than your looks! 3. At weddings. This occasion must be approached with caution. If your fiancé has been planning the perfect wedding for going on two years, a tuxedo t-shirt likely isn’t part of the plan. Show up in this baby, and you might as well head for home. But if you’re a couple with a sense of humor and want to break the tension usually associated with a wedding, this is the way to go. To create a truly custom look, have your names and wedding date printed on the back of your shirt. 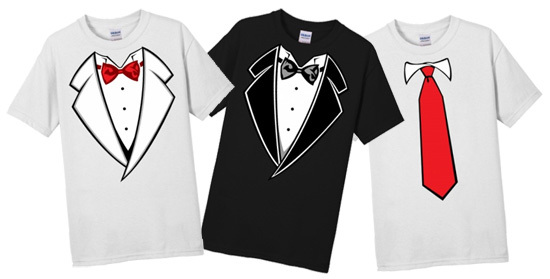 A tuxedo t-shirt could also be a fun choice if you’re a guest at a wedding that isn’t overly formal. 4. At a second wedding. You already endured the pomp and circumstance of a big first wedding. This time around, why not have some fun? Dress in a tuxedo t-shirt (and of course a matching bride t-shirt for her). If you have attendants, let them in on the fun too. 5. As a gag gift. If you’ve got a family member or buddy that absolutely refuses to don a shirt and tie, a tuxedo t-shirt is the perfect gag gift. Try giving it as a party gift at a bachelor party (so the lucky guy can sport it at the wedding rehearsal). What Does the T In T-Shirt Really Mean?